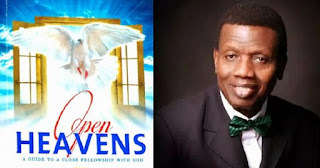 Open Heaven [10 February 2019] The Path to Greatness - Open Heavens Daily Devotional Messages, By Pastor E.A Adeboye. 6 And he left all that he had in Joseph's hand; and he knew not ought he had, save the bread which he did eat. And Joseph was a goodly person, and well favoured. Greatness is the quality of being distinguished eminent or influential. Virtually all human beings have an inherent desire to be great, but only very few end up attaining greatness. Moreover, children of God must learn that appointing someone into a position of authority by manipulation or without God’s approval does not confer greatness upon such a fellow. Hosea 8:4 says such an elevation will be a short lived exercise in futility. In reality therefore, no one can achieve true greatness by personal effort, manipulation or human connections. True greatness can only come by God’s appointment and empowerment, and the pathway to it goes through the fear of God. Anyone who desires to be great therefore must have deep reverence of God. The Bible testifies to the fear of God being present in all the fathers of faith before God bestowed greatness upon them. Abraham received an irreversible promise of greatness after God acknowledged his fear of Him (Genesis 22:12). Joseph’s dream of greatness was fulfilled because he feared God (Genesis 42:18, Genesis 39:9). The Lord blessed the latter end of Job more than his beginning because he feared Him (Job 2:3). God singled out Cornelius for greatness because he had the testimony of fearing Him (Act 10:2). Also, the fear of God helped Daniel to attain greatness in spite of his capacity in a strange land. Furthermore, Ecclesiastes 8:12 tells us a matter of certainty that it shall be well with those who fear God and revere Him. The fear of God automatically confers God’s blessing on His children and causes the Sun of righteousness to arise on their behalf, ushering them into supernatural dimensions of healing and accelerated growth (Malachi 4:2). I pray that as you begin to walk in the fear of God, your journey to greatness will be accelerated in Jesus’ Name.